A Thwarted Child Kidnapping Inspired 'Fruit Of The Drunken Tree' Growing up amid widespread violence in Colombia, Ingrid Rojas Contreras and her sister were targeted for kidnapping. They were saved by the courage and compassion of a teenager working in their home. Growing up as a child in Bogotá, Ingrid Rojas Contreras was almost the victim of a terrible crime. Violence reigned in Colombia under drug lord Pablo Escobar — bombings, kidnappings and assassinations were commonplace. Contreras didn't know it at the time, but her mother was receiving threatening phone calls detailing the routines of her daughters' lives: "They got off the bus at this hour. We know what the bus route is. We know what they look like." 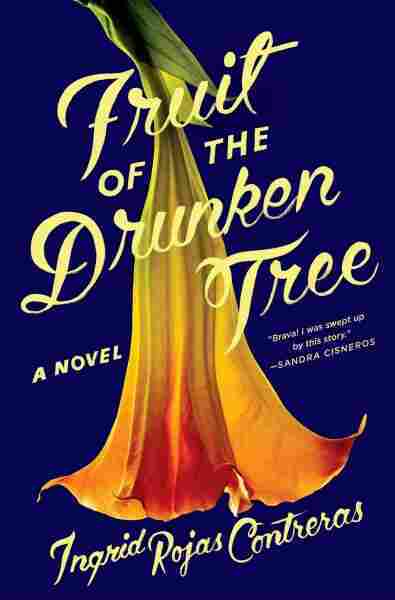 Contreras and her sister weren't kidnapped — and this story of what didn't happen has inspired her first novel, Fruit of the Drunken Tree. This Colombian coming of age story — two stories, really — tells the saga of sisters Chula and Cassandra, growing up in a gated community in Bogotá, and Petrona, a teenager from the city's slums who comes to live with their family as a maid. Because [my mother] grew up in poverty she always wanted to help girls that she saw were stuck in their situations. She would bring them in and they would become part of our lives. One of these girls was a girl that the character Petrona is based on. She was threatened into acting against our family ... but she didn't go through with it. And that act of incredible kindness and compassion is something that didn't leave me for many years. And when I finally sat down to write I just kept returning to that story and I kept returning to my indebtedness for that act of kindness. There was a duality in the country I think — it's incredibly beautiful. We have an amazing array of weathers. We have hot climate ... we have jungle, we have the coast and we have all these hilly, beautiful villages where there's coffee plants everywhere. And yet ... it was a time when violence was just a common part of our lives. We saw it on the television, and it happened to us, or it happened to people that we knew. [Cassandra] has this habit of sitting in front of the television and chewing the limbs of the Barbies. ... They're left with this box of Barbies that have decapitated limbs and ... they interpret this as ... they are working for the guerrillas. ... These limbless Barbies are part of the war. Petrona's story is something that feels very urgent for me to make known. It's this idea that not all people who joined the guerrillas or who join a violent group in Colombia are people who join wholeheartedly. So in Petrona's case, she is someone who becomes trapped into it. She is someone who is placed in a family and can be instrumental to the guerrillas in carrying out a kidnapping, and so for that reason she is cornered and she's taken into it — but she is not a willing participant. I do know, but I do want to respect her privacy. I will say that she did suffer personal consequences for what she didn't do. ... I haven't talked to her since it happened. She called my family a few months ... after the event took place and she told my mother everything. She told my mother what she had gone through and we did everything that we could for her at the time. They're all in between languages — just like I am — and I teach them how to tell stories. We write poems and they write about their experiences, their journeys and their family histories. ... I just feel honored to be there with them and to be a person in their lives. ... As a writer I just know that when we tell our stories and when immigrants tell their stories that it can be very healing and it can be very grounding and it can give you a sense of power and empowerment. ... I love being able to facilitate their stories. Sophia Boyd and Viet Le produced and edited this interview for broadcast. Beth Novey adapted it for the Web.